This is comfort food. This is fill-your-belly, warm-your-soul, take-a-nap, comfort food. And no one does comfort food as fancy as the French. As a culinary student, a majority of my education was based on French cuisine, food history and techniques. I fell in love with French food the first time that I made tomato concassem, which is literally the process of removing the skin and seeds off of a tomato, and then slowly sweating it until it becomes delicate tomato sauce with shallots, garlic and wine. I walked up to the pot frequently and carefully, afraid to disrupt the subtle magic that was on going. The smell of butter and shallots permeated my nostrils immediately and forever imprinted itself on my culinary mind. My affair with French food had begun and it was going to be a long one. One of those forever kind of affairs. French food would become my mistress, the kind that I secretly went to when I was in need for some comforting buttery lovin’. I fell in love with delicious roasts, simple stews and creamy soups. My French chefs always cooked with so much passion and love. It was contagious. They say that doing what you love makes you happy, but watching people excel at doing what they love is true magic. My chef’s did just that for me. I watched their coordinated hands repeat moves that they had done for so many years before in tiny, romantic Parisian kitchens for sweet romantic people who probably ate for hours and never ran out of charming things to talk about. Or at least that was how it replayed in my mind, and at that moment that’s all that mattered. They taught us duck confit (duck slowly cooked in its own fat for a long period of time) and pomme frittes (delicious, delicate little shoestring fries) and beautiful handmade rustic apple tarts that we all silently inhaled. Figure friendly it was not, but this was culinary school and my French chefs said that eating whole fat, buttery food was the way God meant for it to be eaten. To say I was convinced would be a lie, however, this was the one time in my life I would not count any calories, nor think of grams of carbs consumed or grams of fat for that matter. French women were skinny. I would fully invest in their diet and remain pleasant, happy and always full. Despite how “foofy” we may thing French food is, the best French food, funny enough, was originally peasant food. For instance, seafood was peasant food at one time. People tried to use what was fresh and available to them and, especially in the region of Provence, seafood was readily available. Most of the time peasants did not get the favorable part of an animal and so they had to figure out ways to enjoy it and make it taste really good. 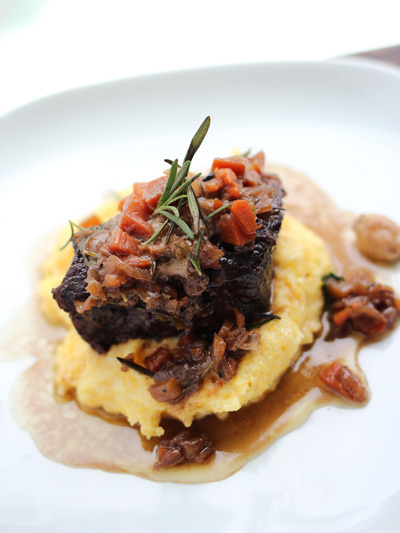 Alas, short ribs enter the picture. At one point, short ribs were ridiculously cheap. Few understood that a tough and typically disposable piece of meat would turn into heavenly, melt-in-your-mouth yum. For home cooks it was too daunting and restaurant owners were not sure if their clientele was ready for it. It was not until the early ‘90s that a chef by the name of Mario Batali started making fantastic braised short ribs and suddenly short ribs were the new prime rib. 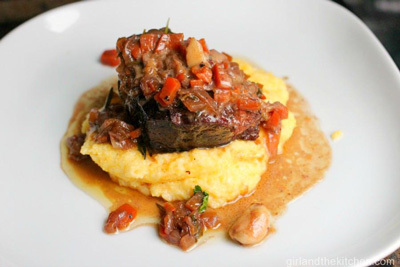 My short ribs are a classic combination of simple and bold flavors. I wanted to pair them with something that could absorb the sauce, and polenta proved to be perfect. Believe it or not, polenta is actually eaten in Provence as well due to its proximity to Italy right across the Mediterranean. Sooo, I have a confession: I bought 2 lbs. of boneless short ribs and ACCIDENTALLY grabbed 3 lbs. of regular beef ribs, and I did not realize this until I came home and was about to cook. But nonetheless, I have now learned this is also an excellent way to prepare beef ribs. 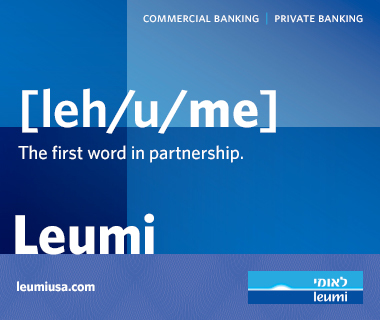 So there you go! 1. Heat up the oven to 325-degrees. If you want to use a crock pot for this, you will still sear and sweat all the veggies, and at the point that we put the pot in the oven, that will be the point that you will just cook it in a crock pot. I have done it both ways, however I prefer the oven route, funny enough to me it seems like it requires less babysitting. 2. Warm up some oil in a heavy bottom pan. You want to use a coconut, avocado or any other oil with a high smoke point. Get it nice and hot. 3. 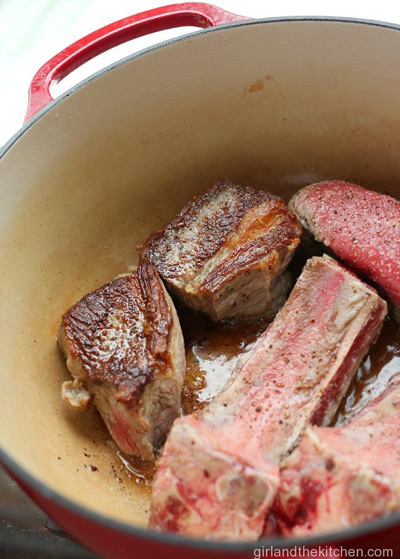 Season your short ribs really, really well with salt and pepper. I always use Kosher salt. 4. Place them in one layer in your pot and let them sear. Don't touch for 5 minutes. 6. You will also want to dice up some carrots. 7. After 5 minutes are up, your flip the meat to the other side and let it go for another 5 minutes. 8. Once all the meat is nicely browned, remove it on a plate and turn the heat down to medium. 9. Check your pot, if you have a lot of more oil than about 1 tbsp (accumulated from the meat) then pour it out. 10. 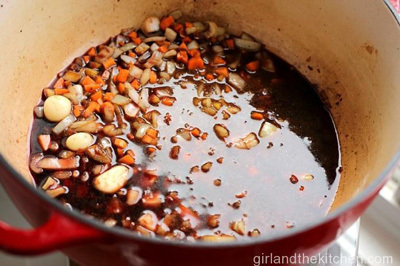 Add your onions, shallots, garlic cloves and carrots to the pot and sweat for about 5-7 minutes until aromatic and soft. Toss them in all those glorious pan drippings. Season with salt and pepper. 11. Turn up the heat and add in about 3 cups of a nice dry red wine. Scrub the bottom as you do this. Pick up all those nice bits that have caramelized from the bottom. 12. Nestle the short ribs back in and add in about 1 cup of chicken or beef stock...it really does not matter which honest. You want the meat about ¾ of the way. Now go ahead and add in one sprig of rosemary and the parsley sprigs. 13. Now just close the lid. Place it in the oven and let it roll for 1 hour. After the 1st hour, remove from the oven and turn the short ribs over to the other side. Place back into the oven for another hour. 14. For the crock pot, let it cook on low for 4-5 hours. 15. If at any point your liquid boils out, pour some more stock in or water. Check the meat after the next hour and ensure that it is fall apart tender. By the end most of your liquids will have reduced significantly and you will have something that looks like this. Well without the fresh parsley on top of course. 16. At this point you have 2 options. You can place the pot in the fridge and let it cool overnight so the fat can solidify and remove it then. 1. Start with 3 cups of water. Bring to a boil. Once it boils add 1 cup of polenta and stir. 2. Stir for about 3 minutes, vigorously. You want to remove all the lumps. Then add in about ¾ of a cup of half and half. 3. Stir in the half and half until it is super creamy. Add in loads of freshly shredded Parmesan. 4. Plate the polenta. 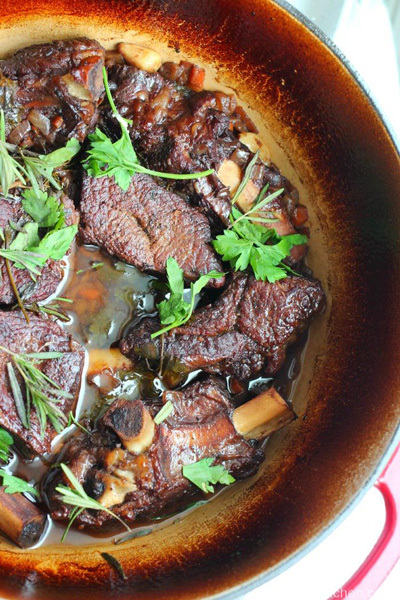 Place a short rib with some sauce on top and have at it.